6 Pack of Pedal Board Pro Effects Cables with Low Profile Right Angle Plugs Model Number: SAGPC6-RV. Pedal Effects Patch Cables. Pack of 6 Cables. 6 Inch. 1/4" TS right angle to 1/4" TS Right Angle. Premium Low Profile Metal Connectors. Brand New. One Year WarrantyThese cables are ideal for cleaning up any pedal board. These 6 inch pedal effects couple cables will make organization much easier and allow for much easier assembly and tear down.. It has a low profile right angle adapter for easy access to jacks that have minimal space for connecting your gear. You can turn any guitar cable into a right angle cable with these adapters. 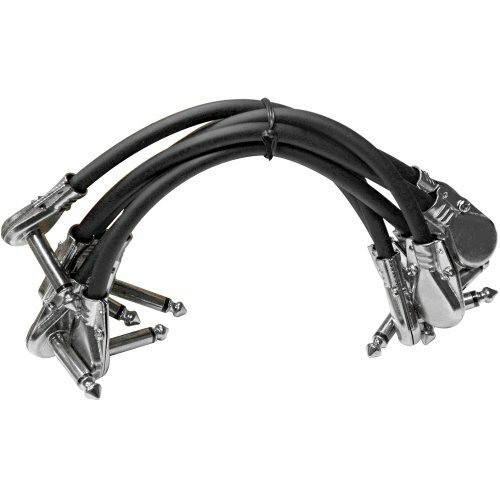 With your purchase, you will receive a 6 pack of low profile Right Angle 1/4 Inch TS connectors pictured and described above. You will also receive top notch customer service, plus all the technical expertise you will ever need is just a phone call or email away! Join the Seismic Audio revolution and see what tens of thousands already know. Whether it is for the garage band, live sound, stage, or studio...Seismic Audio is bang for the buck, the best Pro Audio gear for all PA applications!